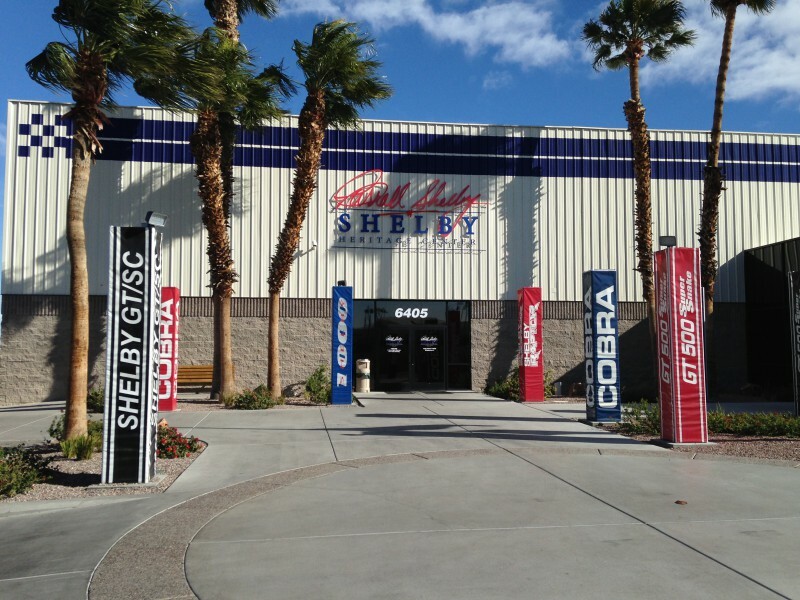 During a recent trip to Las Vegas, we paid a visit to Shelby American. They recently moved into a central location on the south end of the strip and once we heard about the free factory tour, we knew we had to go and check it out. We arrived a little early before the tour and spent some time checking out all the cars in the museum area. There’s a little bit of everything from Shelby’s history on display. Cobras, Daytonas, and Super Snakes…they’re all here. And some of the finest examples we’ve ever seen. We were also surprised to see a GLHS and a Shelby Dakota pickup from Shelby’s years with Dodge. Around 10:30, we gathered with the rest of the attendees for the tour. The tour lasts about 1.5 hours and is quite extensive. Jim King, our knowledgeable tour guide, took us on a journey all the way back to the where it all began. Back to when Carroll Shelby first got started racing all the way up to when he became a legendary car builder. Jim knows his stuff and told many interesting stories about Carroll Shelby that we had never heard. Jim first took us through the museum and talked about several cars in great detail. He then took us through the factory where we could see several Mustangs, Cobras, and even a few Ford Raptors in different states of transformation. After the tour was over, we made one last trip through the museum to get some extra pictures and check out some of the cars one last time before we left. Every car here is special but there are some that stood out to us. CSX2000 is the car that started it all. This was the first Cobra ever built by Shelby in 1962. It still retains its original 260 cubic-inch V8 and 4-speed manual transmission. Other than the paint, the car is unrestored. The bucket seats are tattered and torn with their cottony white insides exposed. This car alone made the trip to the museum worthwhile. Few cars ever created have historical significance like this one. Can you imagine the stories it could tell? Word has it that 26 million has been offered and turned down for the car. CSX4201 is the only hydrogen-powered Cobra ever created. It is equipped with a 427 V8 converted to run on gaseous hydrogen. It was designed back in 2000 in collaboration with the University of California – Riverside. According to the abstract written by the university, the engine was designed to produce near zero emissions at nearly 270 horsepower using a lean burn fueling strategy. Shortly after being built, the car held the record for the fastest hydrogen-powered vehicle reaching a top speed of over 140 mph. The museum also houses a rare Shelby Series 1. These were created in the late 1990s with a limited production number of only 250 cars produced. The Series 1 was powered by an Oldsmobile 4.0-liter engine producing 320 horsepower. They were extremely light and only tipped the scales at around 2,600 pounds. The museum also has one of the most powerful Mustangs ever created. The Shelby 1000 packs up to a walloping 1,200 horsepower and is built on the 2011-2014 Shelby GT500. This has to be one of the most radical, if not most powerful, Mustangs to ever come from Shelby. It’s quite intimidating even sitting still. After the tour, we spent some time checking out the gift shop. This place is huge and has everything from polos and t-shirts to signed items by Carroll Shelby himself. There really is something for everyone who is a Shelby fan. If you’re in town, you really should check out the heritage center and tour. Hours for the heritage center are Monday through Saturday from 9:30 a.m. to 6:00 p.m. Tours are conducted Monday through Friday at 10:30 a.m. and 1:30 p.m. and 10:30 a.m. on Saturdays. For more information, go to shelby.com or call 844-974-3529.